Daniel Braverman: Quick slot guy who is light in the pants or more? 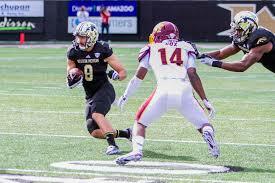 WR-Daniel Braverman, Western Michigan 5′ 10″ 177 lbs. Cons: The first and most important concern is the receivers light body structure at 177 lbs. He didn’t get pressed very often at the line of scrimmage in the five games I watched. Will he strictly be a slot receiver who uses quickness to get off the line of scrimmage? Braverman got knocked around when physical corners mauled him, but has the center of gravity and tenacity to recover. The wide out needs to protect himself better in the open field by not taking as many big hits. The former Bronco has a smaller than average catch radius and is not much help blocking in the running game, only getting in front of a defender for a second or two. He needs to get stronger (only ten reps of 225 lbs. in the bench) and improve his trunk explosion (28.5″ vertical jump) as shown at his Western Michigan pro day. Pros: If you take away his size, everything else this young man does is impressive. He was highly productive in college: 108 catches for 1367 yards receiving with 13 touchdowns (junior year) and 86 catches for 997 receiving yards and six touchdowns (sophomore year). The impressive parts of his pro day were his 4.47 40-yard dash, 4.2 second 20-yard short shuttle, and 6.86 second three cone drill which show off his quick feet and change of direction. The quick-twitched play maker topped at least 100 yards and ten catches against both Ohio State and Michigan State who have multiple defenders getting drafted in the early rounds of several NFL Drafts. Braverman has loose hips, bouncy feet and changes directions effortlessly usually making the first man miss. The wide out runs a developed route tree specializing in crosses, slants, screens, bucket catches near the sidelines, and wheel routes. The former Bronco snares the ball in front of his body maintaining stride with his soft hands, keeping his eyes on the field in front of him. He tracks the ball well in the air, and knows where he is at all times especially near the sidelines showing good concentration. Braverman uses double moves to get open downfield, fights for contested passes even with bracket coverage, and does a good job shielding defenders from the pigskin. Once the play maker has the ball in his hands, he uses spins, hurdles, and stiff-arms to create separation as he streaks down the field. His motor is always running hot. Overall thoughts: If they changed the front cover of “The Engine that Could”, we might see Daniel Braverman’s face. He is an exciting player that might begin his NFL career as a punt returner, where he also impressed due to his size. The wide out would be a great addition to a high-powered offense like New England, Pittsburgh, and/or Indianapolis. I like him in a year or two, but it might take him some time to get enough muscularity to protect himself in the NFL. « Su’a Cravens: Has NFL Skills, but Position?